To reach Rip’s Tavern, drive about two hours west of Chicago on Interstate 80, and take the exit for the village of Ladd (population 1,283). You can’t miss the place: It’s on Main Avenue, just down the block from Ladd Lanes, the Ladd Public Library, Joe’s Ladd Pizza, the Ladd Pharmacy, Ladd Family Chiropractic, Ladd Automotive, the post office, and the Special Effect Barber/Beauty Salon. Still don’t see Rip’s? Look for the line. Depending on the day, it might be spilling onto the sidewalk. Or you might open the door to find a mere 50 or 60 people huddled and chatting in the entryway, amiably squeezing past one another to get to the bar, then squeezing back into line with their Coors Lights or PBRs. For nearly 80 years, Rip’s has been known for two things: Its fried chicken and the length of time people will stand in line to eat it. “The average wait time? I’m scared to even figure it,” said Bill Rounds, who owns the tavern with his brother, Dave. Bill runs the front of the house; Dave mans the kitchen. Sixty minutes? Ninety? “A lot of times our wait is an hour,” he allowed. “A little bit longer on Saturday. Sunday goes pretty smooth. 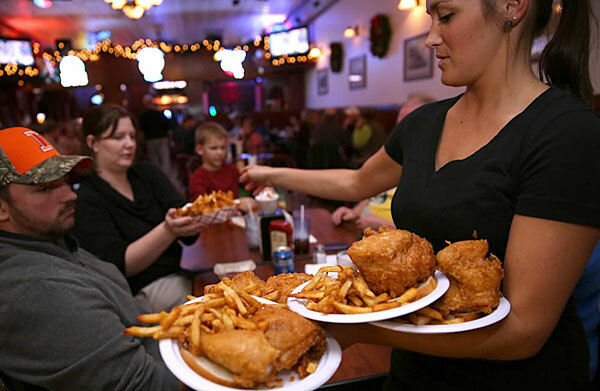 On a Wednesday or Thursday, our average wait is probably 20 minutes.” For what it’s worth, on a recent icy Saturday at 4:52 p.m. — less than half an hour after the first pan came out of the fryer — the wait from walk-in to chicken-chomping was two hours. And that was on Thanksgiving weekend, a time when most people might be presumed to have had enough poultry to last them awhile. Rip’s got its start in 1934, when Bill and Dave’s grandfather — an Italian immigrant named Silvio “Rip” Gualandri — opened a bar in Ladd and started giving away fried chicken to booze-buying customers. Two years later, he moved the operation to its present location, added a dining room, and lent his nickname to the whole shebang. In 1985, the entire place burned down and was rebuilt; a few years later, it was expanded to double the waiting area. The menu has seen a few changes over the years too. Rip fried his chicken in lard, but his grandsons have switched to a blend of canola, sunflower and soybean oils. Your lips will still end up looking like you’ve bought stock in Bonne Bell — this is fried chicken, after all — but your arteries are in slightly less danger than before. If the regulars have noticed a difference, they’re not saying so. “It’s the same chicken,” said Simaytis, who now lives in Coeur d’Alene, Idaho. “I come every time I get back here.” Rip’s chicken is served, for some reason, on a slice of bread. Ignore it. It will only take up valuable stomach space. As for the accompanying fries, they’re good but not as good as the you-know-what. Whether you choose light or dark, the meat is outrageously moist; the skin lightly spiced and cracker-crisp on the outside, with just a gloss of grease beneath. “If you ask, I will give you a fork,” Bill said. Most people don’t bother. As for the chicken, he said, it’s so good because he knows how to choose his birds. “I want a white chicken,” he said. “A lot of times you’ll see in the grocery store a yellow-skinned chicken, and that has more fat.” Also, “our chicken is a younger chicken,” he added. “A bigger chicken is an older chicken,” and hence one that’s harder to tenderize by means of their special marinade. Would he say what’s in that marinade? “Mmm, probably not,” he said politely, adding only, “I don’t rush it. We don’t change how we do anything.” That includes the line.